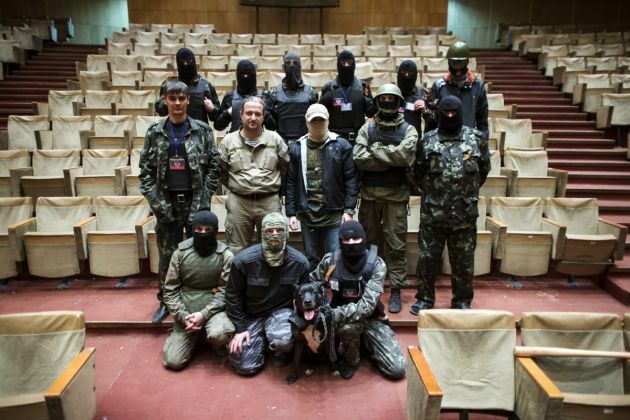 (Photo: REUTERS / Marko Djurica)Masked pro-Russian protesters pose for a picture inside a regional government building in Donetsk, eastern Ukraine April 25, 2014. Picture taken April 25, 2014. SLAVIANSK, Ukraine (Reuters) - Father Vitaly says he prays every day for the armed men who now wield power in Slaviansk, stronghold of pro-Russian separatists who have seized key buildings in a dozen towns across eastern Ukraine this month. "There's a point at which you just can't take it any more and you have to pick yourself up and stand up for yourself," the bearded, broad-shouldered Orthodox priest said of his hostility to the Ukrainian leadership which has taken power in Kiev. Standing under the dark blue cupolas of his church on the outskirts of town, Father Vitaly denies accusations he has an active role in the uprising - including an allegation that he even provides a logistics and command base for the rebels. But he makes no apology for aiding parishioners who have taken up arms against the new government in Kiev and dismisses suggestions that they - or he - takes orders from Moscow. Vitaly, aged in his 40s and with his thinning brown hair tied back in a traditional clerical knot, says they are merely carrying out the will of Slaviansk, where Russian is the first language of most of the 130,000 residents. Many are alarmed by leaders in Kiev seeking to shift the country of about 45 million westward, away from Russia and toward the European Union. Some residents, however, say Vitaly, whose church follows the leadership of the Orthodox patriarch in Moscow, has provided more than just spiritual support for the armed uprising, in fact throwing open the church's property to gunmen who are currently holding several detainees, including seven foreign OSCE observers. The Moscow patriarch is closely associated with President Vladimir Putin and his project to revive a greater Russian national idea. Now some priests in Ukraine's industrial east seem to making common cause with rebels, many of whom hope to follow Crimea into breaking with Kiev and into annexation by Russia. In a mirror-image of the support that clergy loyal to the rival patriarch in Kiev lent to pro-Western protesters in the capital, priests in Slaviansk recite prayers at barricades erected by pro-Russian separatists around the police station. "With the permission of our Russian Orthodox priest Father Vitaly, they relocated to his Russian Orthodox Center," she told Ukraine's UNIAN news agency. Reuters journalists saw dozens of armed men around the church centre on April 12, when the separatists seized key public buildings, and in the days that followed. Vitaly, a well-known local figure whose restored, century-old Church of the Holy Resurrection is one of at least five in the city, said Shtepa was pursuing a personal vendetta against him. There were some gunmen in the grounds but he had not invited them: "I was told there were armed men on the grounds of the centre," he told Reuters. "I went and asked them: 'Please boys, go somewhere else. Don't put the Church in this position'." Those who stayed, he added, did so to protect church property and the priests. In the days after the rebel takeover of the town, a sandbag barricade went up by the leisure centre, and at least one man armed with a Kalashnikov rifle stood guard. "The Orthodox Centre is the activists' headquarters," said a Ukrainian security officer familiar with the separatists. "It's the centre of their operations, communications and weapons storage. Although it's not consecrated ground itself, it belongs to the church." "It's impossible not to see the influence of Moscow," he said, pointing a finger at the Moscow patriarchate. "The church supports what is happening here materially and spiritually." Christianity has flourished since the collapse of Soviet communist atheism but the Ukrainian Orthodox Church split in the 1990s, reflecting in part the cultural, historic and language faultline that divides the country between east and west. The breakaway Kiev patriarch has condemned Russian "evil" while Ukraine's Moscow-led hierarchy seems ambivalent - caught between its patriarch's closeness to Putin and a large Ukrainian flock, many of whom resent Russian political interference. In Slaviansk, however, where critics of Moscow are keeping their heads down, many of Father Vitaly's parishioners say they welcome his overt support. By the barricades, where icons are taped to piled tyres, Nina, 60, fingers a cross around her neck. "We are Orthodox Christians," she said. "The church here stands behind us with their prayers. They understand us and what is right."